Virtual Industries V3200 PAC-VAC Protable vacuum pickup tool kit is battery operated. The Virtual Industries PAC-VAC is battery operated and self-contained, runs up to eight hours continuously on one 9 volt alkaline battery. This Virtual Industries Protable Vacuum Pickup Tool versatile unit can be clipped to your belt or pocket for one-handed portable operation. The Virtual Industries PAC-VAC is constructed with ESD safe materials and comes complete. 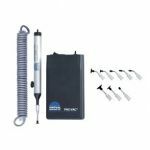 Purchase Virtual Industries Portable Vacuum Pickup Tool sold by Howard Electronics Today!